Hiking up to mountains this season? 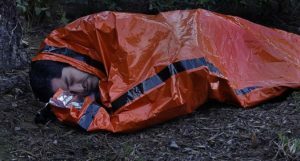 This emergency sleeping bag has to have a place on your list. This super lightweight built with heavy duty aluminized PE material is highly useful. The high visibility orange color will serve you the best when in need. The drawstring carry bag design helps you to hang it conveniently with your backpack.